Karti Chidambaram, following his dad P. Chidambaram's steps, is contesting in Sivagangai. During an interview with Behindwoods Air in the show Ethir Neechal, he spoke about various things concerning the nation and the election. He said that the UPA government did bring Aadhaar but linking it with everything is not a welcomed one. He also wondered what they are doing with the big data and if they are monitoring people with it. He also spoke about GST and how it is wrecking business. He also spoke about how minorities seem threatened by the way they treat them. They feel like second class citizens, he adds. He also said that EPS-OPS government is a mandateless government and the centre is a hated government. He also said that the centre and state should sync and work to make megaschemes to eradicate major issues like water scarcity. He said that BJP government gives "stepmotherly" treatment to Tamil Nadu. He added that the coalition of BJP and ADMK is a path to destruction. He said his dad, P. Chidambaram advised him to smile and interact with people. When answering about cases, he declared that he has no case on his name. He said that like every other dictator, Modi will also fall. When answering about whether how successful they will be in making the 6000 promise a reality, he said it will be more successful than the 15 lakh promise made by the BJP government. For detailed interview, watch the video here. This page contains news relating to various facts and events. The views are generally about current affiars and general topics in diversified areas such as political, international, national, and regional issues, sports, health, travel, lifestyle, technology and business. People having similar interets on the above topics will find this page useful. 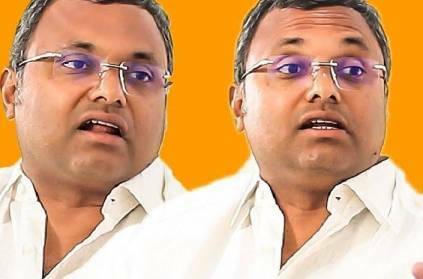 Will it be really possible to give ₹ 6000 Karti Chidambaram | Tamil Nadu News.